It’s a rainy Monday here in Georgia. I’m still fighting this cold, so between that and the weather, it would have been nice to stay at home, curled up in bed with a good book today. Olivia has been congested for a couple of weeks due to a tooth that she has coming in, so Brian and I decided that Friday it would be a good idea to take her to the doc just to make sure her ears hadn’t gotten infected. Good thing we did, because it turns out that she has croup (a very minor case) and two ear infections. I tell ya, this girl is tough. You can’t even tell she’s sick aside from the runny nose that she’s had. She’s been sleeping through the night, she’s been eating, her behavior has been normal (aside from a bit of crankiness that we attributed to the teething), and she hasn’t even run a fever. Thank goodness we decided to be on the safe side and get her checked! We kept her out of school Friday to avoid spreading the germs to school, so she got to have a day off with Daddy. And I got to go home on my lunch break and see them both. Such a treat! Friday evening Jacob and I picked up Cracker Barrel and took it home, and then we spent the evening carving our pumpkin and watching Toy Story of Terror! This is Brian’s and my 13th Halloween together, and this was our first time carving pumpkins together. We go to the pumpkin patch and buy pumpkins every year, but we’ve never actually carved one until now. Ours was pretty basic (and it had to have “vanpire” teeth per Jacob’s request), but the kids still loved it! Next year I suppose we’ll have to step up our game and carve something fancier. Saturday, Brian and Jacob went to the tennis courts while Olivia and I stayed home and did some laundry. I also got a bunch of old photos organized, filed, and backed up. It was nice to get that out of the way since I’ve been needing to do it for a while. Jacob and I went to church Saturday evening, while Brian and Olivia stayed home. Olivia probably wasn’t even contagious at that point, but we didn’t want to risk getting any of the other kids (or adults) sick at church. And my oh my was it quiet at church without her! After church, B and Olivia met Jacob and me as well as my parents at our favorite BBQ restaurant. They have live music on Saturday nights so the kids always love it. They had strung lights around the stage and decorated for Halloween so it was especially festive. Olivia sat in a booster seat in the booth (for the first time) between my Mom and Dad (instead of a high chair), so she thought that she was something else! Sunday we went to Your Pie for pizza and gelato for lunch, and then we took the kids to one of our larger parks for a walk in the woods. The weather was a little on the warm side (upper 70’s), but the majority of the park was shaded from an abundance of trees and there was a nice breeze so it was actually pretty comfortable. 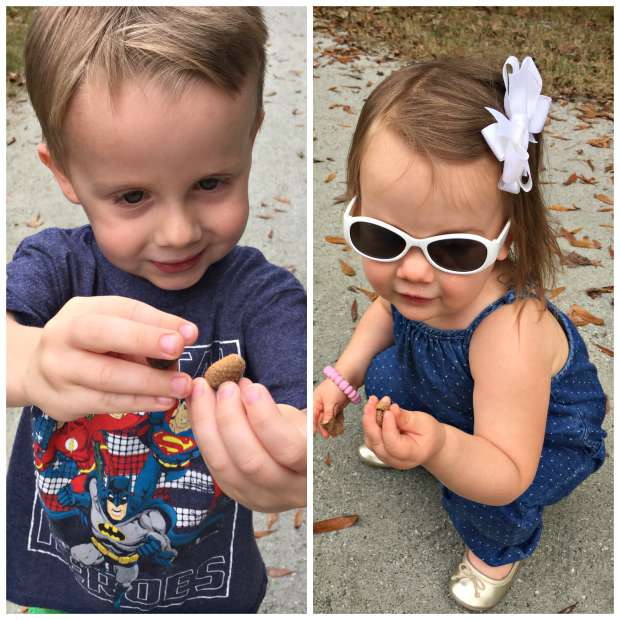 We fed the geese and the kids walked around finding acorns, or “corn” as Olivia calls them. We stopped at a playground for a little bit, and then we ended our walk on the dock at the lake. The leaves were falling from the trees, and there were leaves crunching under our feet. It was such a peaceful walk. Have I mentioned that I love this time of year? Sunday evening after naps, we headed to my parents’ house for family pictures. My parents have woods behind their house, and it always makes the perfect backdrop for pictures. Usually my dad takes them for us every year, but since he was picking up my grandmother for dinner, my brother took them instead. As always, things were a little chaotic… Jacob was a little angel, but Olivia… well, let’s just say that she woke up on the wrong side of the crib after her nap. I bribed them both with marshmallows, so I’m hoping that we were able to get at least a few good shots. I haven’t had a chance to sort through them yet, but I’m hoping to get share them with you later this week! It sounds like you had a great weekend! Olivia is quite the fashionista - I love how you dress her! What a fulfilled weekend!!! Love your matching shoes..that is just too precious. Hope little miss is feeling better! Cute pictures from your weekend! XOXO I hope you and Olivia feel better very soon. My cold has lingered for over a week now, too. I want it to just go away! Fun! Things I am jealous of - Olivia wearing bows and sunglasses! It's a constant struggle to keep them both on at our house! Looks like you had a fun weekend! Hey girl, I hope you and Olivia are feeling better. I was feeling pretty nasty last week too, so I feel your pain. How fun that you guys carved pumpkins together for the first time! Isn't it funny how you can do things for the first time like that and then wonder, "Hey, why didn't we do this before?" Olivia and Jacob's pjs are adorable and those boots. I love them! Thanks, Marie. I'm feeling a little better, but it JUST KEEPS HANGING ON! And now poor Jacob has it, too. And yes, WHY didn't we ever carve pumpkins together? Especially since I love doing all the crafty things!! Olivia is a champ! I hope you two are on the mend! I can't wait to see your family pics!! We're getting there, but poor Jacob has been dragged into the mess as well. He's holding up just fine, though. No missed school, luckily!